Muckers took me incredibly by surprise for one reason: I’m reading a book set during World War II, and somehow I still felt like the social climate hasn’t changed that much sixty plus years later. The novel is based on a true story of the Jerome Muckers. The Muckers in this novel are fictional, but they felt entirely real. We follow “Red” O’Sullivan (Anglo Irish), Rabbit (Italian American), and Cruz (Mexican) as they take up their places in the last football season their town of Hatley will ever have. Theirs is a mining town, which has run dry. The people of the town still cling to shreds of hope, and that hope is football. Football becomes this magnanimous thing, greater even than the power of the lonesome church, and the townspeople put their belief in those kids. There are some, like Cruz, who keep believing that everything is going to be okay. That Mr. Ruffner (the owner of pretty much the town) will change his mind about closing down the mine, and that they’ll be able to keep going. There are others, like Red’s father, who are broken from such a hard life, that they resolve to drinking and (barely) basic human functioning. Hatley itself is this living, breathing thing that is holding on just barely, it seems, to see the team become champions. And I loved learning about the town as much as I learned about it’s inhabitants, each of them adding layers to the story and to Red’s life. A part of me wanted so very much for a Disney type of resolution, with one of the kids finding an open vein of ore during football practice. But as much as the town is built around the mine, and the mine plays a role in the life or death of the town, the hope of the town lies in a group of scrawny boys whose field is made out of slag. While the adult workers fight their own struggles, the Hatley young Muckers have their enemies in the form of rival teams with new uniforms, equipment, and a field that isn’t called “Hell’s Corner.” The Cottonville Wolves are the worst, and I actually found myself hating this fictional town that never did anything to me. The more the Muckers keep winning, the more I want them to be okay. I want to pull them out of the story and tell them that history is wrong. That segregation is wrong. That miners shouldn’t have to live off dirt wages. That Rabbit doesn’t have to enlist in the war. That Red’s mother is going to get better. The ugly parts of the novel (and I mean ugly in the sense that history can be a cruel thing to read about) is the discrimination that is underlined in the novel. Red says it best when he’s in the middle of English class and his teacher is putting the fear of Commies into the hearts of his students. “It’s a funny thing about our town. …everyone’s got the spirit of good ol’ Hatley High. They rally on the sidelines of our football games, but if you want to go for a swim, or say, get married, it better be ‘with’ or ‘to’ your own kind. We come together during the day, but we all head home to our places on the hill. If you climb up from Main to Company Ridge–Gringo Ridge, Cruz likes to remind me–you’re right and her run the mine your house overlooks. If you stay on Main and follow it to the city limits…you could be Rabbit’s dad…in the middle of Little Italy. If you walk down the hill in the direction from the pool hall that fits your nationality, chances are you work in the mine. Yeah, that’s pretty emotional to read considering Arizona was still in the headlines in 2014 on account of banning Mexican American studies from public school and not being disability friendly. And when they passed a bill that made it okay for businesses to discriminate against gays. So as I’m reading about a town with a football team made up of mostly Mexicans, led by a ginger named Red O’Sullivan, during a time of the Red Scare, I found myself wondering about the kind of progress (or regress) we’re making as a society in 2014. One of the most heartbreaking parts of the story (there are many) is when Red falls for Cruz’s sister, Angie, who has permanent discoloration on her hands because she works at the pool and has to bleach it every time “Mexican hours” are over. Angie who hopes for a little while that they might be together, but realizes she’ll never be able to come to terms with an interracial romance because “they” would always make her feel like she’s doing something wrong. Don’t worry, there is hope. At the end of it all, there is hope, and it comes in the form of young and bloody football players with big dreams. Even as the town deteriorates around them, they have this one thing that no one in the world can take from them. In the Author’s Note, Wallace remarks on how incredible the nature of this story is, but it never made any sort of headlines in it’s day, which is very sad indeed. I’m just glad she was able to tell a version of it that is filled with just as much heart. 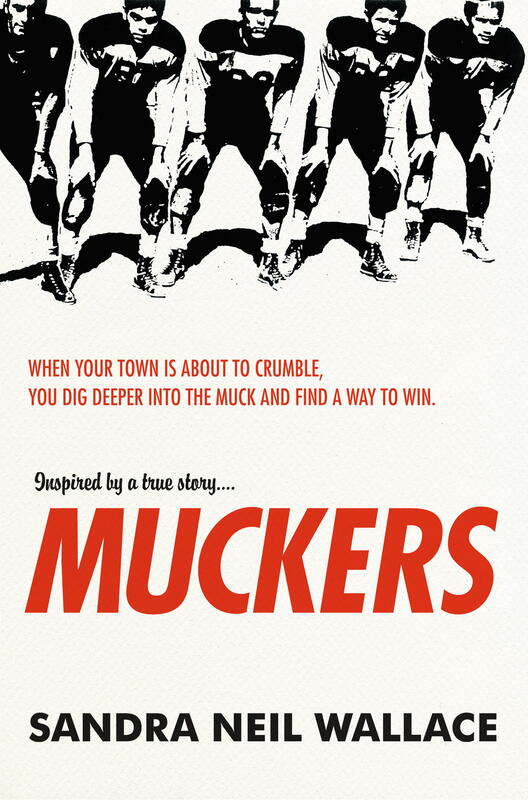 About the author (from Goodreads): A former news anchor and ESPN sportscaster, Sandra Neil Wallace may have snagged her best lead yet in uncovering the inspirational achievements of the Jerome Muckers football team. She discovered the story while sifting through a box of letters and other memorabilia. The trail of letters led her to write Muckers. Sandra was named an outstanding newcomer to the children’s literature scene by the Horn Book following the publication of her first novel, Little Joe. She lives in New Hampshire with her husband, author Rich Wallace, and travels to Jerome, Arizona, to visit the surviving Muckers players. Add Muckers to your Goodreads!